Not cool. And also much too common. 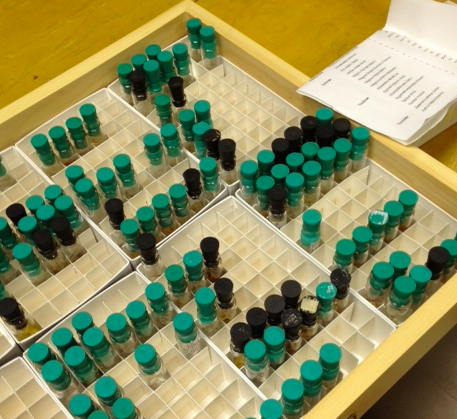 Bottom line: when specimen-based research is done with arthropods, whether it is a biodiversity inventory, a community ecology study, or a taxonomic revision, the researchers must deposit voucher specimens in a research museum or institutional collection. This is only way to truly verify that the work is accurate, that people are calling things by the same name, and it puts a stamp in time for the research. Without deposition of these voucher specimens (somewhere that is publicly accessible and curated, and along with data about time, place and collector) the research cannot be verified, and this goes against the principle of repeatability in science. Beetles in drawers: a great example of specimens in a curated museum, and shows how such specimens can be used for all kind of research! This is a no-brainer, right? It’s time to test whether or not scientists actually bother to deposit voucher specimens…. As part of a graduate-level* class in Entomology last winter, we surveyed the literature to find out the frequency of voucher deposition with arthropod-based research. We looked at papers to see what percentage actually report on vouchers, assessed whether the frequency of voucher deposition varied by research type, study organisms, institution (of researcher), and whether voucher deposition has changed over time. We published the results a few weeks ago, in the Open Access journal PeerJ, and our work has revealed a crisis in arthropod-based research. Overall, rates of voucher specimen deposition were very low, as only 25% of papers report on the deposition of voucher specimens. This is horrible, and essentially means that the specimens from the majority of papers published cannot be traced to a collection, and cannot be verified. The main findings of our research: the asterisk illustrates a significant difference relative to a global mean. Figure from our paper, published here. Is there any good news? Perhaps so… when looking at rate of voucher deposition over time, more papers are reporting about vouchers in 2014 (35%) compared to 1989 (below 5%). PIs must be responsible and proactive on the process of voucher specimen deposition, from the start of any project. Graduate students need to be mentored appropriately about the importance of voucher specimen deposition. It needs to be recognized that voucher specimens are important for all branches of arthropod research – there is no reason that entomologists should do better than, say, crustacean biologists. Close collaboration between Universities/Research Centres and Museums is required, so that there is an agreed up, and easy process for all researchers to deposit vouchers. Everyone involved with arthropod-based research needs to work together to push for long-term, sustainable funding for institutional collections/museums so that proper curation of vouchers can be done. Publishers and editorial boards need to have clear policies about voucher specimens, so that any papers published are required to report on vouchers. I recognize that the title of this post is provocative. Is it *really* a crisis? I think it is: I think that even the best rate of voucher deposition that we report on is too low. We must aim to be closer to 100%. It’s important as we work to describe the world’s biodiversity, understand what is happening to our species in the face of climate change, or track the distribution of invasive species. It’s important that our hard work is more than a publication: our hard work is often a specimen, and that specimen needs to be accessible for future generations. Voucher for critters than need to be stored in liquids looks something like this. * A most sincere thanks to my graduate students Shaun, Elyssa and Chris – these students did the lion’s share of this project, and took on this graduate class with great enthusiasm, maturity and motivation. You all inspire me! You raise some interesting and important points in this post Chris, though I think that perhaps the situation is not as clear-cut as you make it appear. When we are surveying pollinators, for example, we only ever collect individuals that we cannot accurately identify in the field. Common, well known, easily identifiable species are not collected. In some cases it’s not even possible to collect them because we are observing their behaviour as they move between flowers. Does this mean that the data points pertaining to those species are “non-repeatable”? I don’t believe so. Also, the voucher collections that we put together have an ongoing use for our work and so we store them at the university, where they are easily accessible. Their long-term fate, of course, needs to be thought about and perhaps at a much later date we’d consider donating them to a large museum. Much to think about here, thanks for writing this. Thanks for the comment, Jeff. Right – you do raise an important point – I think the ‘spirit’ is that somewhere there is a voucher for the species that you are focusing on with your study – maybe from an earlier inventory or publication, or maybe ‘now and then’ some representatives are collected and deposited. But indeed, for observational-based or behaviour-based studies, especially for well-known species, vouchers would be impossible and not always necessary. Our work was really more about arthropod-research that is truly based on specimens, e.g., in a community ecology of biodiversity-type study where the identify of the species needed to be determined as a key attribute of the data. Hope this makes sense. Thanks again for the comment – always appreciated!! Just a thought. Even if it is a common, easily identifiable species, maybe it would be interesting to deposit vouchers. What if someone does a taxonomic revision in the future and finds that what was thought to be a single, widespread organism was in fact more than one species? Especially if it is a common species, taking a single individual would do no harm, and would be of great value. Thanks for the comment, Ivan. In principle I agree with you, completely. Sometimes there are great questions to be asked, say, about morphometrics, which may involve needing many individuals from common species. On the practical side, I think most collections are overwhelmed already and trying to keep up and curate more common species could be a challenge. One problem with voucher collections being deposited in museums is the erosion of technical assistants for the collections. Museum scientists themselves tend to catalogue only those specimens relevant to their own research. General cataloging of incoming material is given to ‘collection managers’ and their assistants, and they are often the first cuts when money gets tight. We need more communication between universities and museums to ensure that voucher collections are given the proper care they need, along with supporting documentation. Thanks for the comment – Agreed! I think it should (in part) be the responsibility of whoever deposits specimens, to also deposit relevant meta-data, and have them ready to slot into the collection. We certainly need excellent communication among all relevant institutions. @jeffollerton: Trochosa terricola was locally well-known…until it wasn’t. If the identity of the arthropod species is critical to the interpretation of your behavioural data then yes, it too must be vouchered. It would be interesting to extend the present meta-analysis by actually assessing the dangers of non-repeatability. You’d convert species identity to probability surfaces and re-run the analyses. That conversion would incorporate speciation rates & likelihood of establishment of non-native sister species. Finally something to consider: is a barcode an adequate voucher in lieu of a physical specimen? Thanks for the reply, David: I agree that the future holds great opportunities, including some thinking around what a ‘voucher’ really means. Does it always have to be an actual specimen? I would say no – it really depends on the context/project. And yes, if the identity of a species is not *critical* to the interpretation than vouchers may not be needed. Great post (and paper) Chris! I agree this is an important issue, but I wonder if the problem lies not so much with a lack of researcher’s motivation to deposit specimens, but a lack of knowledge/connection to do so. In Australia, there are very few university courses (let alone whole degrees!) that expose students to entomological collection & curation techniques, because costs/lack of demand for these courses led most unis to shut down those departments. So most non-entomologist scientists now graduate from their degree with very little understanding of these processes (I was certainly one of those!). In addition, if you don’t have a museum connection already through mentors/colleagues, it can be very hard to start that relationship, or even know who to approach, especially if your supervisors/mentors/direct colleagues are not ento people. It sounds silly, but I found it quite overwhelming trying to figure the ento processes/techniques out during my Phd (my supervisor wasn’t an entomologist and I was working at a uni that had no ento courses) – all the little details about pinning techniques, storing techniques, how to send specimens to a museum etc., can be hard to learn without mentorship. Thanks for the comment! I agree with you – I think that is a big stumbling block. Having the right mentoring is key, as is having access and the appropriate network. I’m extraordinarily fortunate, for example, because there is an entomology museum at my University – and the people there can help facilitate the process of depositing vouchers. There are countless numbers of institutions that just aren’t that lucky, so the process is very difficult and daunting. And I don’t have a great solution for any of these issues, except for perhaps increased awareness, and I see technology (social media etc) as being a way to facilitate making the connections necessary. Again, you raise very important points, and thanks so much for commenting!